Bimal Gurung today said the Gorkha Janmukti Morcha would forge an alliance with a few regional forces in north Bengal to contest the coming Assembly polls. The Morcha president, who was in Sibchu today to observe "Balidaan Diwas," organised to remember three party supporters who had lost their lives in a police firing on February 8, 2011, also said such an alliance would help defeat Trinamul. "We will tie up with regional forces, including some political parties, ahead of the coming Assembly polls. We are already an ally of the BJP and will field candidates in Assembly constituencies in the Dooars and Terai, apart from the Darjeeling hills, to defeat Trinamul. Soon, our party will hold a meeting in Siliguri where we will formally announce the names of our allies," Gurung told journalists this afternoon. Morcha sources said the prospective allies include the Kamtapur Progressive Party's Atul Roy faction, the John Barla faction of the Akhil Bharatiya Adivasi Vikas Parishad and the Dooars Millat-e-Islamia (DMI). The Atul Roy group of the KPP, which wields clout in the Terai and some pockets of the Dooars, and Barla were with the BJP-Morcha combine in the 2014 Lok Sabha elections. Barla enjoys support in tea gardens in the Dooars and Terai. The DMI is the most influential organisation of Muslims in the Dooars and is not averse to the tie-up with the BJP. Barla and Moktar Khan, a leader of the DMI, were present at today's programme and said in unison that they were with the Morcha and would strive against alleged step-motherly attitude towards the Dooars by the state government. "A number of Morcha leaders in the Dooars are sitting idle. As the polls are round the corner, they should wake up and initiate consistent political activities in the region," Khan said at the event. Gurung had said earlier that unlike the 2011 Assembly polls when the Morcha had fielded candidates in only three hill constituencies and supported Wilson Champramari, the Independent in Kalchini, the party would field candidates in around 15 seats across north Bengal this time. At today's programme, Gurung criticised the state government and chief minister Mamata Banerjee. "Mamata Banerjee is doing 'use-and-throw' politics. She is using people for her own political interests and throwing them away once her interests are fulfilled. She is trying to play politics and divide different communities in the hills. However, she will never succeed in her intentions," Gurung said. "I have also decided to come down from the hills ahead of the Assembly polls and campaign to defeat Trinamul." He also demanded a probe into the sources of funds for development boards formed by the state for different hill communities. "The state government is using the money meant for the GTA to pay the development boards. We demand a complete investigation to find out from where the state is getting funds to pay the boards which the chief minister has created to divide the people in the hills," the Morcha president said. "The state has endorsed the term Gorkhaland (by inserting it in the GTA agreement) but now it is interfering in the functioning of the GTA and speaking against our demand for a separate state. We have taken up the matter with the Centre. The state is, however, acting in a detrimental manner and even delaying tripartite meetings on the GTA," Gurung added. He also trained guns at former Morcha leader and Kalimpong MLA Harka Bahadur Chhetri. "He should prove himself by winning the coming polls. He does not have even the minimum support base in the hills," Gurung said. Chhetri, who resigned from the Morcha last year, has recently formed the Jan Andolan Party. Senior Morcha leaders, including Roshan Giri, Kurseong MLA Rohit Sharma, Ramesh Alley and Binay Tamang, were present at the meeting. 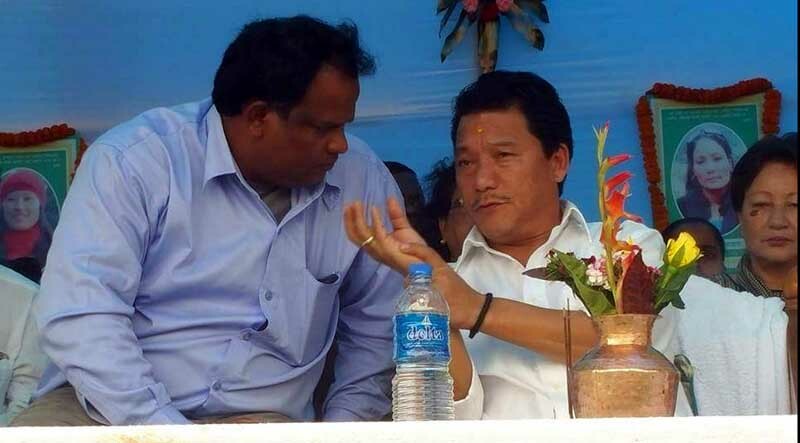 GJM‬, ‪‎BJP‬, JMM, KPP and DMI to Contest 2016 Elections Together in North-Bengal, Bimal Gurung today said the Gorkha Janmukti Morcha would forge an alliance with a few regional forces in north Bengal to contest the coming Assembly polls.